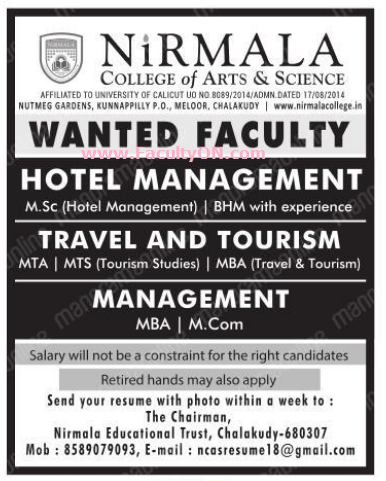 Nirmala College of Arts and Science, Thrissur has advertised in the MALAYALA MANORAMA newspaper for the recruitment of Teaching Faculty jobs vacancies. Interested and eligible job aspirants are requested to apply 07 days from 20th June 2018. Check out further more details below. About College: Nirmala College of Arts & Science is affiliated to University of Calicut and offers undergraduate programmes with a view to providing best possible environment for the students to develop their career into employable graduates. The campus is located at Meloor, Chalakudy with excellent infrastructural facilities, which enhances the professional ambience for students to explore and expand their knowledge horizons. How to Apply: Interested and eligible candidates are requested to send application along with their CV, copies of certificates and PP size photos to the following email address or postal address.